The new Firebase announcements made at Google I/O 2016 really make Firebase a first-class citizen in the Google ecosystem. Firebase is bringing together all of Google&apos;s best offerings and packaging it into a clean and easy-to-use package. Firebase went from 110,000 developers when it was first acquired by Google in October of 2014 to 450,000 developers currently. You can bet with the announcements at I/O, that number will skyrocket even further, especially with the new Android and iOS mobile centric features. There was a Firebase coup over at Google. They are now the combination of so many of Google&apos;s best services. Simple Pricing: Who Doesn&apos;t Like Free? We&apos;re big fans of Firebase here at Scotch and have written a Real-Time Scheduling App using AngularJS and Firebase in the past. We&apos;re looking forward to creating some more apps and using it for some of our production level sites. Congrats to James Tamplin, David East, and the entire Firebase team for this massive announcement. Strap in for a long article; Firebase announced a ton of awesome stuff. Firebase isn&apos;t just a backend as a service anymore. It&apos;s THE developer backend to use for Google services. It can&apos;t be understated how important this shift is for Google and for Firebase. They provided a simple and unified platform with so many of the best Google features packed in. All of the above can now be implemented when using Firebase. One platform for all of that goodness. That&apos;s a lot of time saved so that we can focus on the actual things that make our apps/sites unique. Let&apos;s take a look at the features and walk through the new material design site. Not only is this a massive upgrade in the features that are provided, Google went all-in on Firebase and showed the fruits of their acquisition just 18 months ago. Firebase is all of Google&apos;s strengths wrapped into a neat platform for developers. 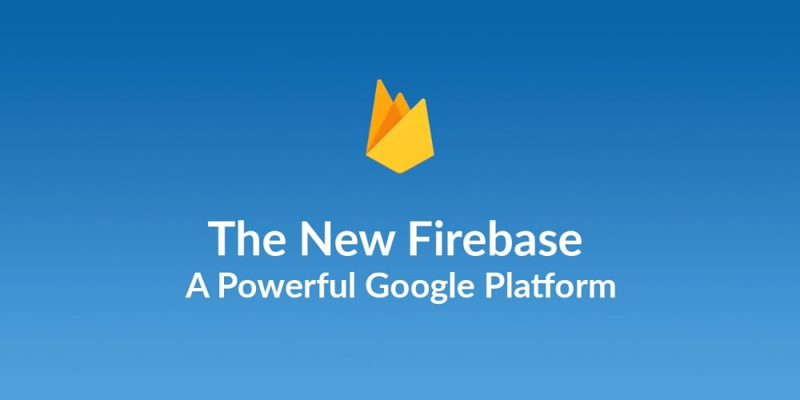 Firebase can now be seen as the glue that brings together so many of Google&apos;s offerings. With Firebase, analytics are now free and built-in. Ads can also be easily taken advantage of. All of this from a single SDK, with a single dashboard, and one place to go for documentation. Let&apos;s go into these in more depth. This is a giant showing and the fact that Firebase now incorporates so many features is going to make development life easy for the users that want to take advantage of some or all of the features. Firebase has had three features (realtime database, authentication, and hosting) for a long time now and they&apos;re a blast to play around with, especially realtime database. Easily sync information across all your users. We built a demo to show off the realtime database. When we click one of the scheduling times, we can see our database change in the Firebase dashboard. All in realtime. Fun stuff. It&apos;s important to note that this app was made on the old Firebase dashboard. With one click, I was able to bring it over to the new dashboard, no coding changes required. No need to create your own database, create your own API, and handle all that stuff that usually comes with creating a backend for our applications. Firebase realtime database handles that for us. The docs give a great overview and samples of how to use the realtime database on Android, iOS, and for the web. Also, give our Firebase articles a try. The authentication side of things got one of the biggest upgrades. New SDKs, upgraded backend infrastructure, and more. Email verification and account linking have been added. Be sure to take a look at the Firebase Authentication docs. Once the Firebase CLI is installed and setup, you can easily deploy your applications. It&apos;s that easy to get your app/site hosted. This is where the insanity starts. Firebase&apos;s scope went through the roof. The vision Google had when they acquired Firebase eighteen months ago is starting to become clearer. With all the new features, the dashboard had to change to reflect all the new things. As with all things Google, Material Design was brought in and the dashboard is a clean with its left sidebar of all the features. Built-in and free for all Firebase apps is a strong analytics suite that takes a page from Google Analtyics. Since Firebase uses the same systems as Google Cloud Platform, Cloud products can be used with our Firebase app and its data. Need advanced querying? We can export data to BigQuery. Here&apos;s some code to log an event in an Android app. Events can then be analyzed in your dashboard. You can take a look at more of the events that can be logged in the analytics docs and the Android analytics docs. Firebase now has the ability to host our files and upload them through the SDK. This effectively means that we don&apos;t have to go around creating a storage account elsewhere, like AWS S3. // Sign the user in anonymously since accessing Storage requires the user to be authorized. In the above example, we have handled authentication and uploading a file. Then we can see all our files in our singular dashboard. The security model for the Storage SDK is similar to the security that the realtime database offers. It&apos;s mad easy to secure files against actual users. Other providers will make you manually register ARMs and ACLs and then map those to users. Instantly update variables for your applications. This means that you won&apos;t have to wait for a long deploy process to get new data into your applications. Enable or disable features, change out the theme, and more without having to publish a new version of your application. Think of these as settings that you control like an app overlord sitting in your tower (Firebase Dashboard). All from within your Firebase Console. Firebase Cloud Messaging (FCM), which was previously Google Cloud Messaging is available for free and at no cost. Send out notifications to your users no matter what device they are on. FCM already sends 170 billion messages per day to 2 billion devices so it already has an answer to the popular question: "but can it scale?". There&apos;s a bit more code involved here since there is setup required on all the different types of apps you will be creating. Be sure to check the Cloud Messaging docs. Get prioritized, actionable reports to help you diagnose and fix problems in your iOS and Android apps after they have shipped. Crash Reporting is also connected to Audiences in Firebase Analytics so you can do a deep dive into which types of users are running into crashes on which devices. Manage and send notifications to users using the above-mentioned Firebase Cloud Messaging. Using the dashboard, you can talk to your users, reengage them, and more. Firebase Notifications also offers analytics for who uses and dismisses your notifications. A functional way to navigate your users around your mobile apps. Links survive app installs so they will persist the install process and your users won&apos;t be lost in the shuffle. Dynamic Links also work across any devices, iOS, Android, desktop and mobile web. Users that click links will be taken to the Play Store or App Store if the app isn&apos;t already installed. Monetizing is one of the main things developers need to do aside from well... developing. Most of us aren&apos;t building these amazing things for free! Revenue tools are built into Firebase and leverage all of Google&apos;s considerable knowledge with ads. AdMob is a mobile ad platform with targeted, in-app advertising. It also works with Firebase Analytics to provide app usage and ad data. As you&apos;ve seen throughout this article, there are links to the documentation all over the place. Easy to navigate and with lots of code examples, the Firebase team knows that documentation is one of the biggest reasons a platform will succeed. Give the docs a read through for whatever platform you&apos;re on (iOS, Android, Web, or all of them!). The samples section is also a great place to look to see if Firebase is the right fit for what you&apos;re goig to be building. With three pricing tiers, Firebase has greatly simplified a boatload of tools into one platform at simple price points. Spark (Free): Great price to tinker around with Firebase applications. Some of my fun side projects are on the free tier including our scheduling demo. Flame ($25/mo): A ton of value for $25/mo. Should hold a lot of developers until their apps grow to a much larger size. It&apos;s brilliant that they can offer so many services that you would&apos;ve had to piece together and pay for separately under one roof. I&apos;d be interested to see comparisons by anyone that has a current app that would fall under the Blaze plan. How does that pricing compare to what you&apos;re currently paying? With Google pushing Firebase for mobile development now, you can bet there will be a huge uptick in the number of users signing up for their mobile app backends. Those are just some of the great features mobile developers can now leverage. What does this mean for Firebase? With the Play Store and App Store growing every month, that&apos;s a lot of developers that can leverage this Firebase&apos;s backend-as-a-service. Firebase jumped from 100,000 users when it was acquired in October 2014 to 450,000+ this month. With this set of mobile centric features, I can only imagine how much larger their userbase will grow. Very exciting stuff for the great team over there. While there are many people in the cloud game (AWS, Azure, Heroku, Google Cloud Platform, and more), it&apos;s still relatively early on. There are many companies that can still make the switch, so the battle rages on for cloud dominance. Many people like Azure for its clean interface. Many like Heroku for its simplistic setup. Others like AWS because of its giant array of tools and how they all work together. I don&apos;t know much about Google Cloud Platform except that when I first used it, it wasn&apos;t going to win any beauty contests. That&apos;s greatly changed since they upgraded so I&apos;ll have to take a further look. Firebase is like all the strengths of so many cloud hosting services wrapped into one neat and clean package. Firebase is Google&apos;s secret weapon in the cloud and mobile game. Firebase can be seen all over the Google I/O 2016 schedule and for good reason. It&apos;s the forward facing future of Google&apos;s cloud platform. Overall, a very forward thinking upgrade, especially in the mobile and cloud space. I might seem excited about the things Firebase announced; that&apos;s because I am. I do still plan on writing my own Node and Laravel APIs and backends. Handling my own databases and realtime messaging. But I will also be integrating Firebase more into my apps depending on the project. I can only spend so much time writing similar APIs when starting new projects. Really great group of announcements and features. Feels like a Firebase coup. Their scope is giant and I&apos;m excited to see what the future holds for Google Cloud and Firebase.